This craft project is fun and delicious. 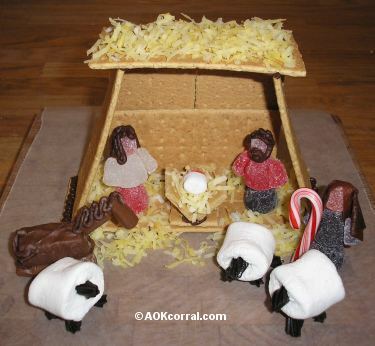 Use gingerbread or graham crackers for the stable and an assortment of candies to make the nativity characters. Great nativity craft for your group this Christmas. Includes all patterns and instructions for this entire project without margins, ads or logos. Bonus: The PDF Version is great to easily print multiple copies to use with your Sunday School, Troop members or other group. This nativity craft would be great for your Sunday school, troop, or family group this Christmas.